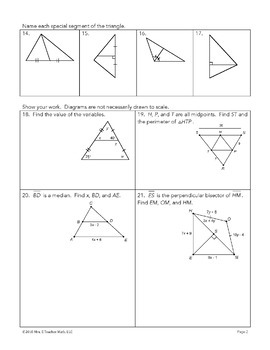 This is Unit 5 in my Geometry curriculum. 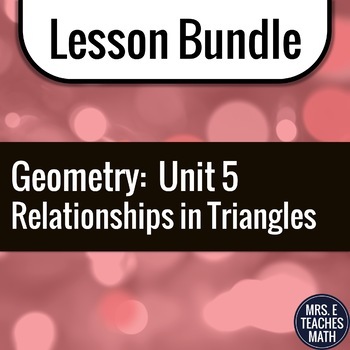 This NO PREP unit bundle will help your students understand medians, altitudes, perpendicular bisectors, angle bisectors, midsegments, and the Triangle Inequality Theorem. • Each lesson has a warm-up, guided notes, and homework assignment. • Completely worked out solutions are included for everything. • A short suggested pacing guide is included. The whole document can be seen in the preview. • A 4-page unit review is included (only available in the bundle). • An editable unit test is included. The test is unformatted so that you can copy and paste the test questions that you like. It is not meant as a stand-alone test. 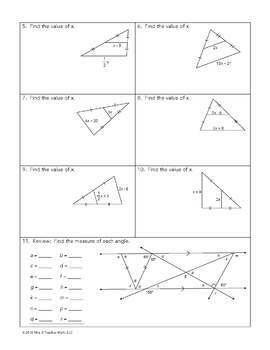 An answer key is NOT provided for the test questions. This file is a word document. 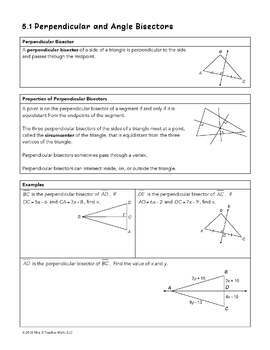 I teach this unit as a mini-unit, so it is designed to be a fast unit with an overview of the segments in triangles. Make sure this unit is appropriate for your students - see the preview to see some of the pages in the product. You can see each lesson in more detail by clicking the links above.